We can understand why ice cream makes us cold or why chewing on ice can give our mouth a chilly zing but why mint? The answer lies in a bit of mimicry. Nerves rely on electrical pulses to send message to and from the brain. It is definitely in our best interests to know when something is hot or cold so we have receptors all over our bodies that can send nerve signals to the brain when triggered by temperature changes. The mouth of course has many, one receptor protein that detects cold is called TRPM8 (for those of you who really want to know that stands for transient receptor potential cation channel, subfamily M, member 8). When we place something cold in our mouth the drop in temperature triggers a change in the TRPM8 receptor, effectively switching it from a closed to an open state so that it allows certain ions (calcium and sodium) to flow through. This flow of ions generates the electric current that triggers the nerve signal sent to the brain, and we register the sensation of cold. So what has mint got to do with all of this? Well, it seems that a change in temperature is not the only thing that triggers the TRPM8 receptor. Other natural compounds such as menthol, eucalyptus and icilin can trigger it too. 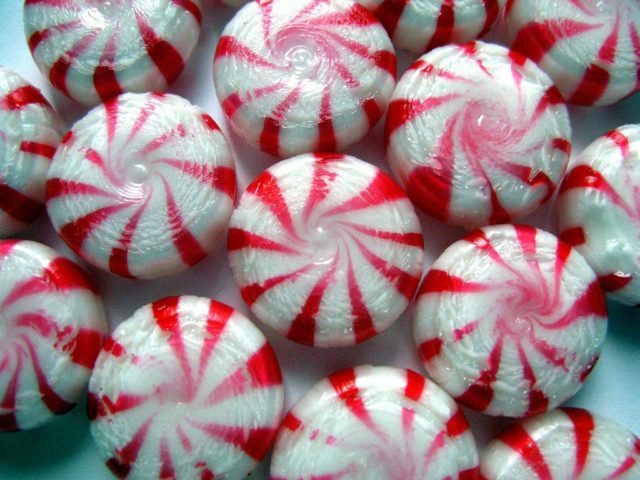 Menthol is a waxy compound present in most mints and mint oils, such as peppermint, and is responsible for the minty taste and smell. Methol is known to mimic the effect of a temperature drop on the TRPM8 receptor, when it bind to the receptor it causes its ion channel to open, just as a temperature change does. Although this mechanism is well recorded, the reason behind it is still unclear. Of course we don’t have to eat mint to get the cold effect; TRPM8 receptors are found in many places in the body and particularly in our skin, rubbing menthol oil on the skin can give the same effect as ice… causing local desensitization and numbing and even reducing swelling. Awesome! I’m saving “transient receptor potential cation channel, subfamily M, member 8” in my mind and will find somewhere to use it in conversation some day.